Without any further ado, let’s revise feature enhancements. If you head to Accommodation menu on your WordPress dashboard, you’ll find the new Attributes menu. 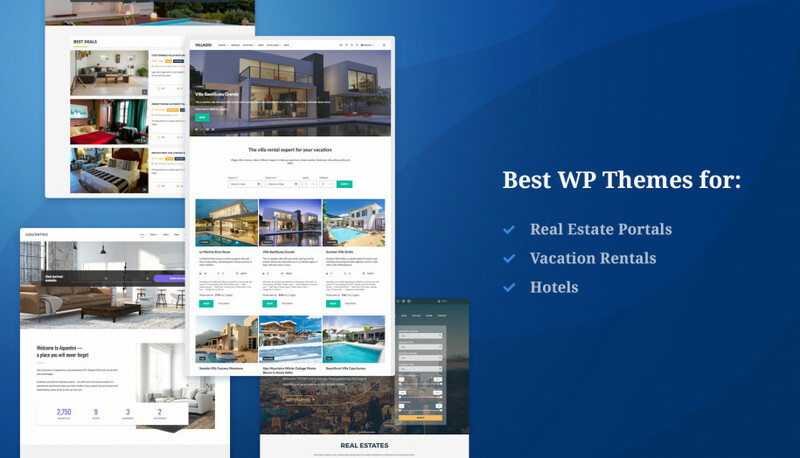 It’s developed to provide you with more flexibility over the sorting fields you may set for the search availability form as well as for a property listing details. 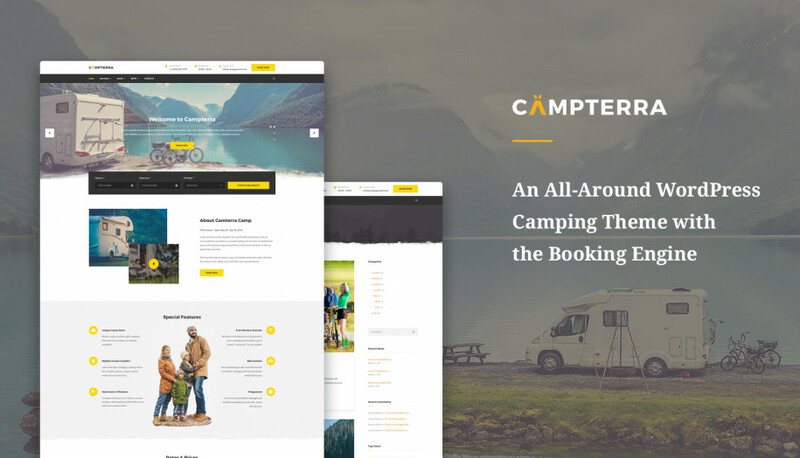 For example, you can supply your accommodation types with extra attributes like location, type, price range and let visitors sort the search results using a wide range of attributes. Basically, attributes serve two main functions: help you add unlimited number of extra info to the property details and add extra advanced search fields to the search availability form. ﻿ How does grouping accommodations by attributes work? First of all, you should add all attribute categories and assign tags to them – you are not limited to the number of items you can add. Add the main Attribute category (e.g. Location). 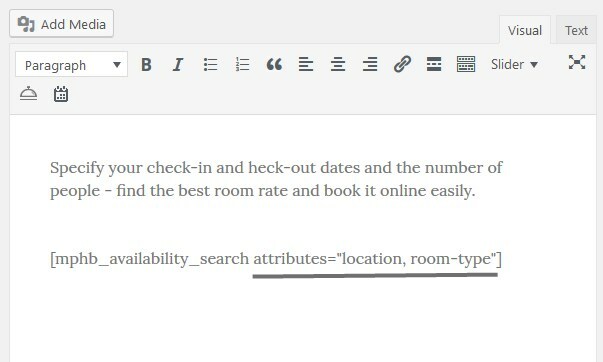 Enable Archives implies that by clicking on this attribute the visitor will be able to search across this category and see all accommodation types with this attribute assigned. Select a preferable default sort order. Choose “Name” for sorting the items alphabetically. If you are going to use numbers (e.g. to add “Sleeps” attribute and use numbers), you should set “Name (numeric)” order as it’s relevant for number values. 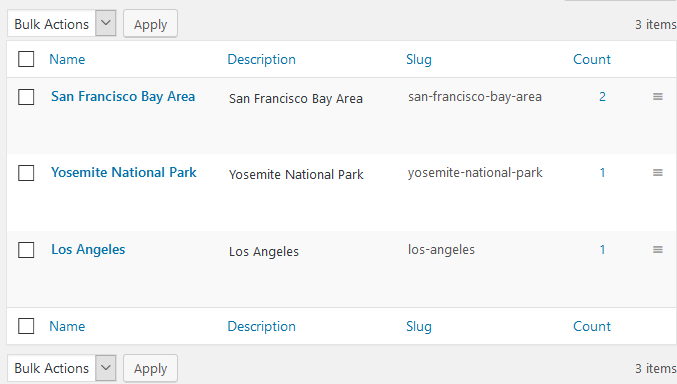 Opting for “Custom” ordering, you can set the order by dragging and dropping the tags inside the attribute. Add as many attributes with any number of values as required! Now you have to assign all appropriate attributes to the specific Accommodation types > just tick all needed boxes in the Attributes menu of the needed Accommodation type (from the right Accommodation type menu). The number of new fields will depend on how many attribute slugs you include into the search availability shortcode. You can create a really advanced search form with multiple search parameters of different types! You should give it a try and share your feedback with us. 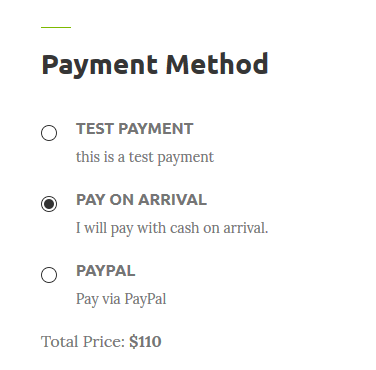 If you want your guests to choose a Pay on arrival payment method (or offer it as the only one available, for example), make sure to go to Settings > Payment Gateways > Pay on Arrival tab > enable this method and customize its labels that will be visible on the frontend. 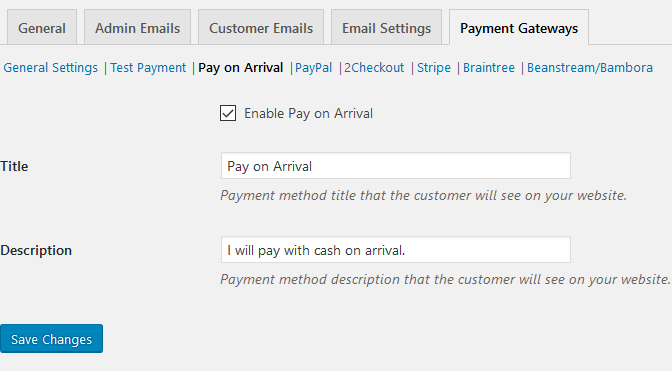 Now filing the payment history of each booking is easier! 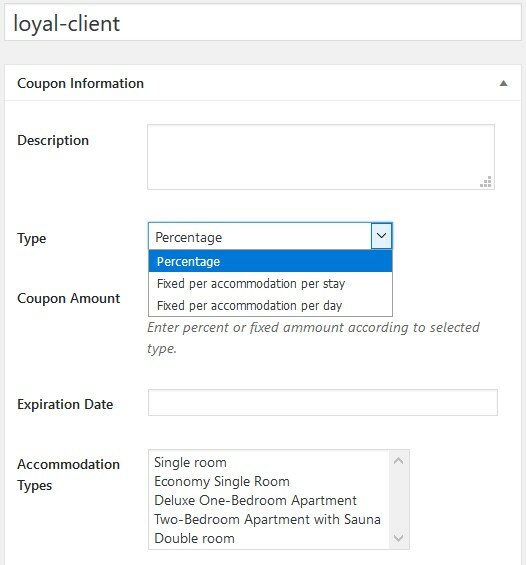 If you are creating coupons for the first time, make sure that the use of coupons is allowed via Settings > General tab > Enable the use of coupons. We hope that this update will help you create any type of a promo campaign without limitations. 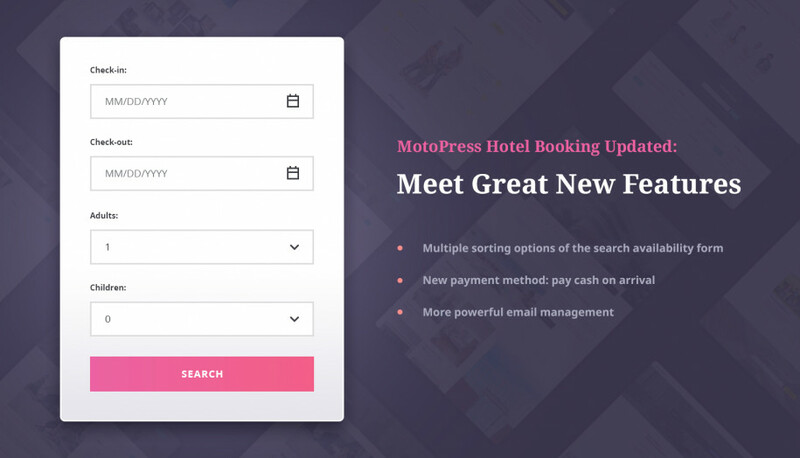 It shouldn’t be a problem to notify different staff members about new bookings simultaneously – with the updated WordPress booking plugin you can do that effortlessly without extra turnarounds. To add multiple recipients of admin emails, go to Settings > Admin emails > Update “Recipient” field with a needed number of admin emails. You can do this for all types of admin emails – each has its own field. Enjoy a better level of automation on email notifications! If you are sure that the vast majority of your guests are the residents of your country, improve their user experience of filling in the booking form: in the admin settings, select the country that will be displayed as a default one in the billing details form on the checkout page. This doesn’t mean the travelers won’t be able to change it! If their country of residence is different from the one you predefined in settings, they can change it in clicks. 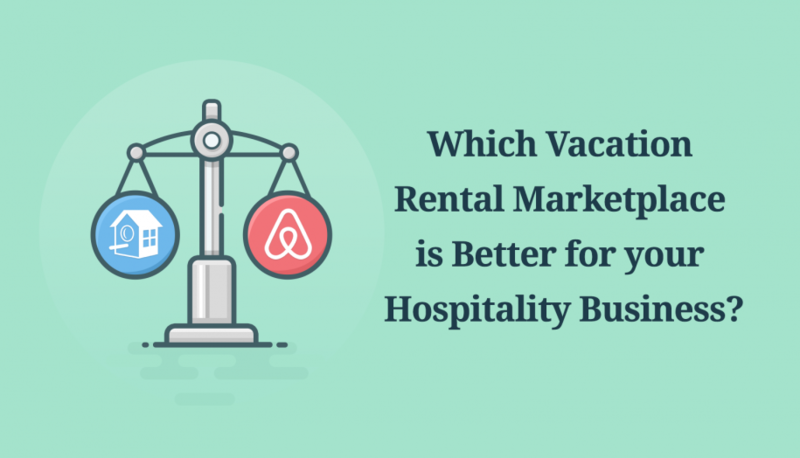 The availability calendars of all properties should now do a better work at displaying your booking rules (for example, not-stay in days are properly marked as unavailable). If you run into the issue with the Braintree enabled in several plugins, we’ve fixed that problem! Now there should not be any conflicts. How do you like the new release? Let us know if there are any other features you’d be happy to see in the plugin! 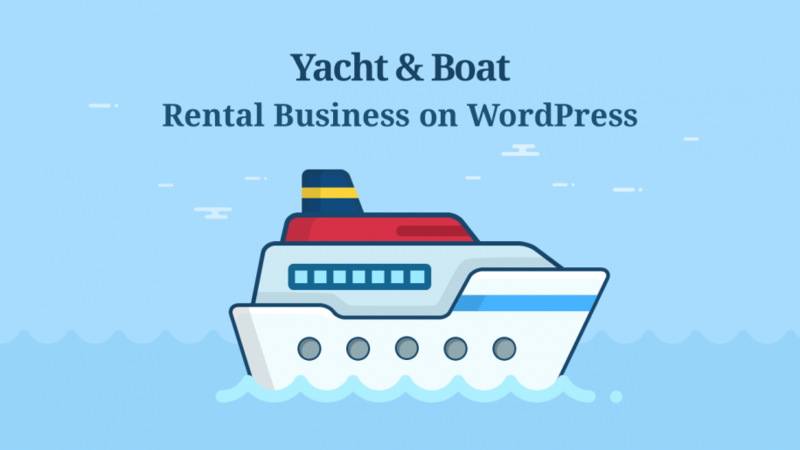 Looking for the best WordPress themes for rental properties? Check out our collection! Hello guys, Thanks for these instructions. Can you copy the advance search code here? I tried it on my personal demo and I can’t get it to work. Many thanks in advance.